I have always been intrigued by the paint pour trend. I have loved the idea and the look, but the thought of mixing a bunch of chemicals together and the mess of mixing paints frightened me. So, when American Crafts asked if I would like to try their new Color Pour collection, now in Jo-Ann Fabric and Craft Stores, - with NO mixing involved, I was excited to say the least! When I got the Color Pour Kit, I was kind of surprised. I mean, this was it? I was sent the Tidal Wave Paint Kit. 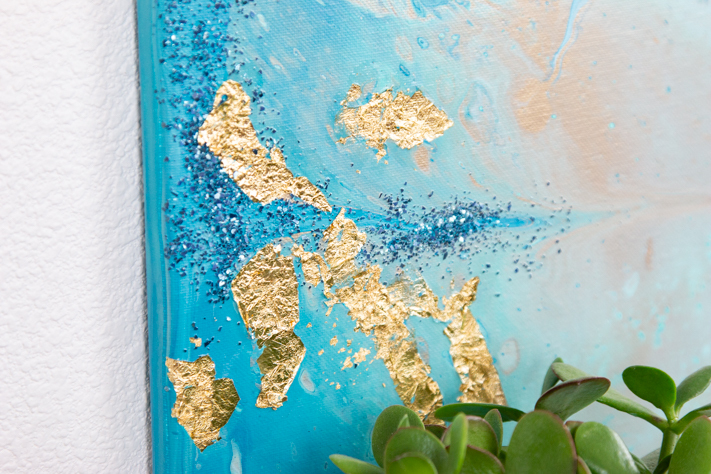 I also chose to add the Pre-Mixed Metallic Paint in Gold because I can never get enough gold in my life. Ha! To watch the full tutorial, go to the website here where there is even list of frequently asked questions! The process was easy for an 18x24 canvas. 1.Prep my area with a tarp. 2. 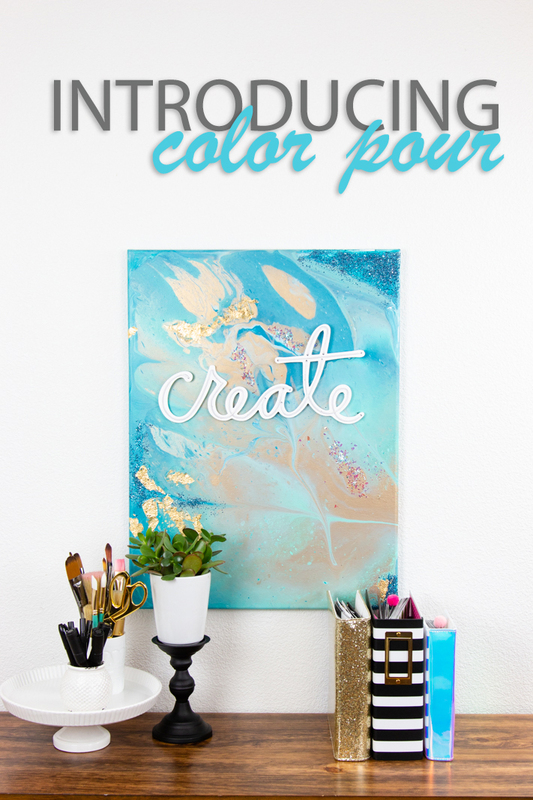 Pour Metallic paint into one large disposable cup (cups provided in the starter kit). Or use the Color Pour Measuring Cups sold separately. 3. Pour all the paint from the kit from lightest to darkest into the cup with the metallic. No mixing needed. 4. Turn cup upside down on canvas (place canvas on cup upside down and flip canvas over). Watch the video to see how easy it really is! Move the canvas around to have paint go across the entire surface. 5. With the canvas propped on upside down plastic cups, have the canvas dry overnight. I did this project after putting the kids to bed and let it sit overnight. I was able to move the canvas in the morning off the tarp, but it still needed to dry for another 6-8 hours before I could touch the top of the surface. While the canvas was wet, I did add glitter from the Galaxy Surge Kit. For those that have been following me, know I have a terrible anxiety to glitter. I loved being able to add glitter without the glue in the kit. 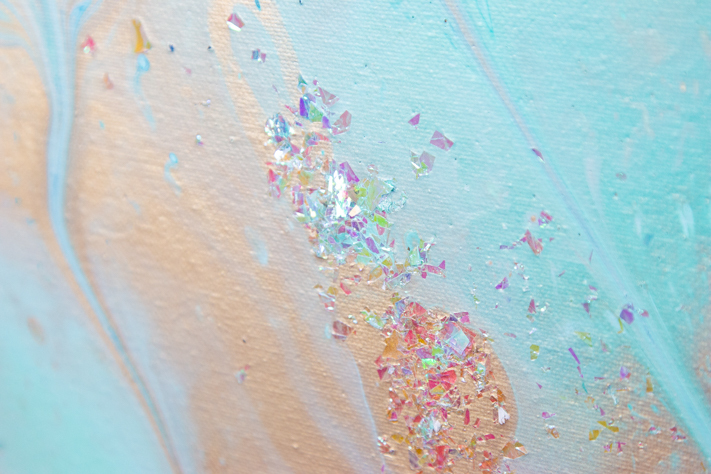 I just poured the glitter to the wet paint and let it dry. I was able to easily pick up the tarp the next day and throw out any glitter that fell. Best clean up ever! 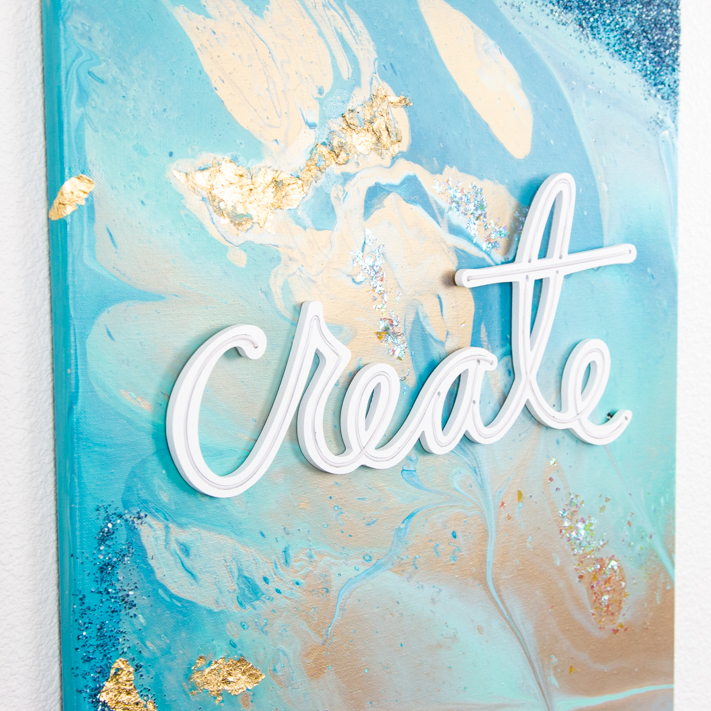 After the canvas was completely dry, I added gold foil flakes. The flakes seem to be the same as Heidi Swapp's Foil Flakes so it was easy to use with glue and a paint brush. 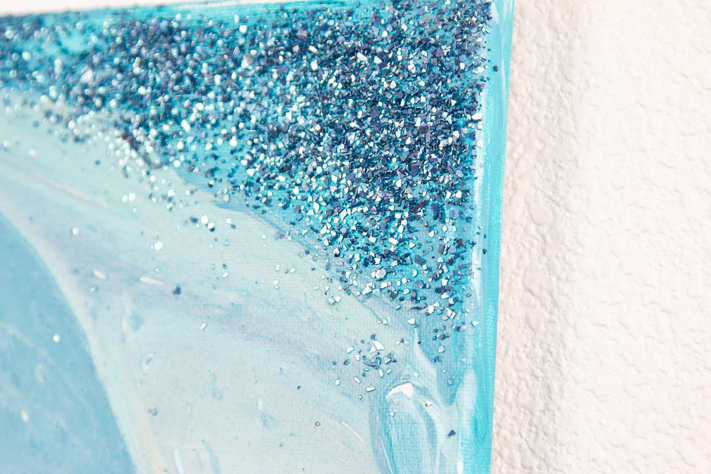 I followed some of the original flow of the pour to tell me where to add the flakes. The texture is so much fun but it all seems to go since the kits are all in the same color family. I hope you give Color Pour a try! It was such a fun experience! 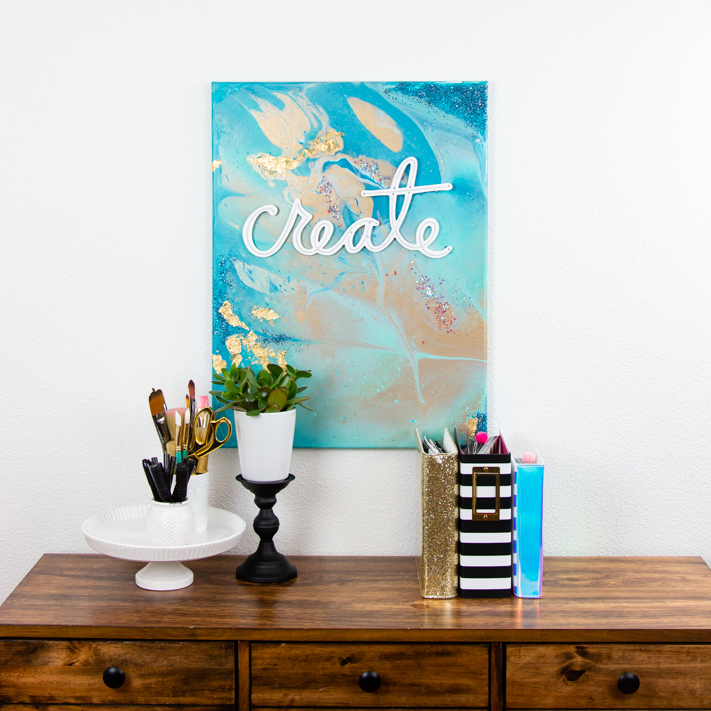 I was thinking of putting a vinyl quote on my canvas until I decided it would be awesome to add a Heidi Swapp Neon Word right on the top! I just sliced a small hole in the canvas with a craft knife and pushed the wire through. Then, the battery pack can sit behind the canvas to turn on at night for a fun glow! 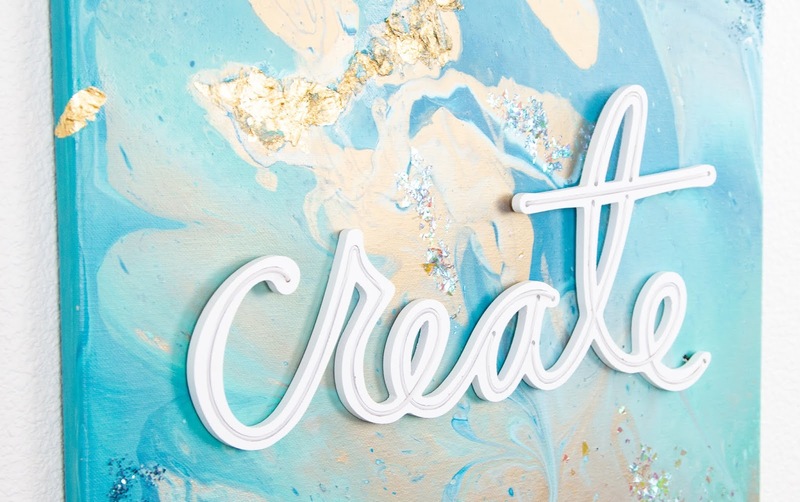 You can find all the Color Pour and Heidi Swapp Neon Wall Words at your local Jo-Ann Fabric and Craft Stores or online here.